New trials of a technologically advanced wire rope lubricant introduced to the international market by ROCOL® have prompted highly positive feedback from a leading offshore contractor. ROCOL, an established manufacturer of lubricants for global industries, says its BIOGEN WIRESHIELD solution is being increasingly acknowledged for its extreme performance levels and green credentials. 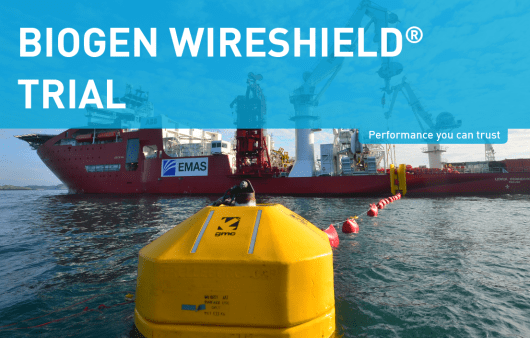 BIOGEN WIRESHIELD has already been the subject of praise from Fugro Subsea Services personnel after it was successfully trialled on ROVs (remotely operated vehicles) operating from its Grampian Surveyor vessel during deepwater operations off West Africa. Now it has received similarly upbeat feedback from vessel management aboard EMAS CHIYODA subsea installation and construction vessel Lewek Connector after it was deployed during operations in the Gulf of Mexico and Nigeria.